FOR years, it seemed as though only one photograph of Nelson Mandela existed. It showed him with bushy hair, plump cheeks, and a look of serious determination. But it was a black-and-white shot, so grainy it looked ancient — a visual documentation of an era and an individual whose time had long passed. In the early 1960s, fed up with the systematic oppression and inhumane treatment of indigenous Africans, Mandela successfully proposed a plan of violent tactics and guerrilla warfare, essentially forming the military wing of the African National Congress. Within a few years, this martial division, aptly named Umkhonto we Sizwe or Spear of the Nation, was discovered and its leadership detained. In 1964 Mandela was found guilty of sabotage, and ordered to serve a life sentence. I was 5 years old when Nelson Mandela became prisoner number 46664, and was banished to spend the remainder of his years on Robben Island, five square miles of land floating just north of Cape Town. Robben Island had been the site of a colony for lepers, a lunatic asylum and a series of prisons. It was a place of exile, punishment and isolation, a place where people were sent and then forgotten. But the haunting image in that photograph did not let us forget. In the 1970s, I was a member of the African Youth Command, an activist group that protested against social and political injustices. We idolized Mandela. We hung posters of that photograph in our dormitory rooms; we printed it on pamphlets. We refused to let Mandela fade into irrelevance; we marched, held demonstrations, staged concerts and boycotts, signed petitions and issued press statements. We did everything we could to decry the evils of apartheid and keep his name on people’s tongues. We even burned effigies of John Vorster, Jimmy Kruger and other proponents of that government-sanctioned white supremacy. Freedom on the African continent was a reality for which we were willing to fight. Nevertheless, I think we’d resigned ourselves to the likelihood that Mandela would remain a prisoner until his death, and South Africans would not experience equality until well after our lifetimes. Then on Feb. 11, 1990, the miraculous happened; Mandela was released. The world was spellbound. We wondered what we would do if we were in his shoes. We all waited for an indescribable rage, a call for retribution that any reasonable mind would have understood. Twenty-seven years of his life, gone. 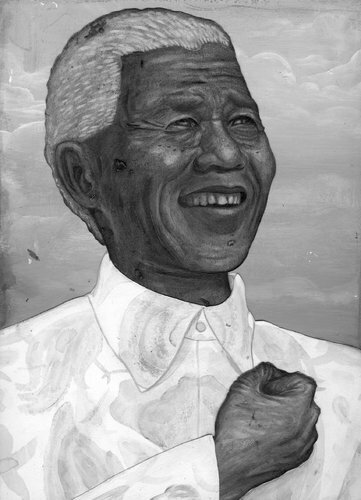 Day after day of hard labor in a limestone quarry, chipping away at white rock under a bright and merciless sun — without benefit of protective eyewear — had virtually destroyed his tear ducts and, for years, robbed Mandela even of his ability to cry. By the time I finally came face to face with Nelson Mandela, he had already been awarded the Nobel Peace Prize and elected president of a land in which he and all other black people had previously been refused suffrage. He had become an icon, not only of hope, but also of the possibility for healing. I was relatively new to politics then, a member of Parliament and minister of communications. It was my first time in Cape Town. I had stayed out late with friends and was waiting to take the lift up to my hotel room. When the doors opened, there was Mandela. I took a step back, and froze. As he exited, Mandela glanced in my direction and nodded. I could not return the gesture. I couldn’t move, not even to blink. I just stood there in awe, thinking: here was the man for whom we had marched, sung and wept; the man from the black-and-white photograph. Here was the man who had created a new moral compass for South Africa and, as a matter of course, the entire continent. It is no coincidence that in the years since Mandela’s release so much of Africa has turned toward democracy and the rule of law. His utilization of peace as a vehicle of liberation showed Africa that if we were to move beyond the divisiveness caused by colonization, and the pain of our self-inflicted wounds, compassion and forgiveness must play a role in governance. Countries, like people, must acknowledge the trauma they have experienced, and they must find a way to reconcile, to make what was broken whole again. That night, as I watched Mandela walk past me, I understood that his story, the long walk to freedom, was also Africa’s story. The indignation that once permeated our continent has been replaced by inspiration. The undercurrent of pessimism resulting from the onslaught of maladies — wars, coups, disease, poverty and oppression — has given way to a steadily increasing sense of possibility. It wasn’t just Nelson Mandela who was transformed during those years of his imprisonment. We all were. And Africa is all the better because of that.